All the advertisements I’ve ever seen tell me we’ve arrived in paradise. Palm trees fringe white sand beaches, turquoise waters shimmer, dotted with fallen flowers so abundant they’ve resorted to decorating the ocean’s surface, for lack of anyone around to pick them. In the distance, waves designed by Fibonacci himself peel one after the other, whitewash mirroring fluffy cumulonimbus towering above an endless blue horizon. 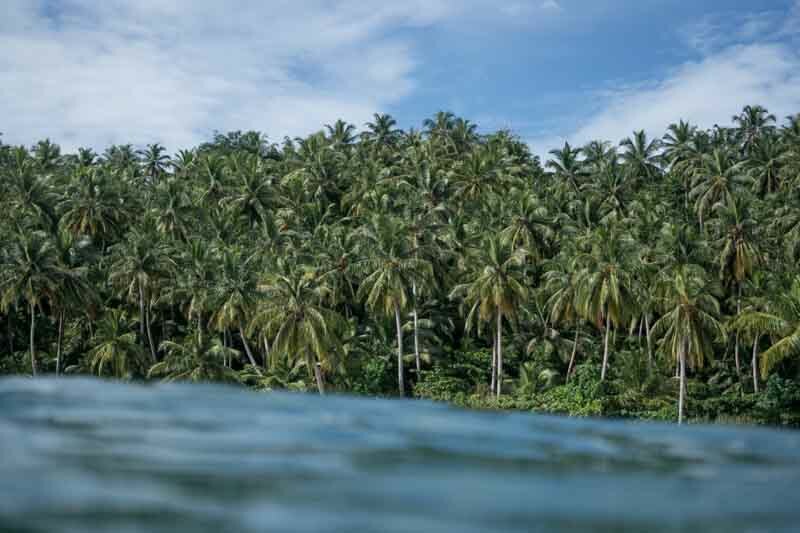 It’s Mentawai, you’ve made it, what more could you want? Have you ever imagined that maybe there’s more to this perfection, that this is not simply a divine paradise made for 2 weeks of surfing perfection? That even the best lenses can’t make out the sandflies, sweaty jungle, tangled vines, and sharp cavernous reefs beneath all that sickly sweet imagery? I want to get deeper. After a few days, we talk to some people and find a pair who will take us 8 hours upriver, deep into Siberut Island’s jungle to visit some of Matty’s old friends. They are some of the last remaining Mentawai indigenous people, who have thus far resisted colonization, the Indonesian government’s attempts at centralization and gentrification, and aggressive missionaries. We’re greeted by Aman Lepon, a shaman, whose sharp eyes recognize Matty after a few seconds despite his big beard and long hair. They hug like brothers, and I’m struck by the beauty of his hand-tapped tattoos that follow the contours of his body, his red headband and loincloth, and colourful beads around his neck. We’re welcomed into his uma (longhouse), where there are about 30 people sitting around the big open room, two thirds of them children, running and laughing and climbing and wrestling with dogs and each other. Most striking is the vibrancy of life, the pulsating humanity evident in the big open rooms of the uma. Every footfall rumbles the heavy hardwood floorboards, and adults emanate a striking contentedness, seated on benches that line the outer edges of the open-walled building. A toddler starts crying, but nobody flinches – some little misunderstanding that will sort itself out. 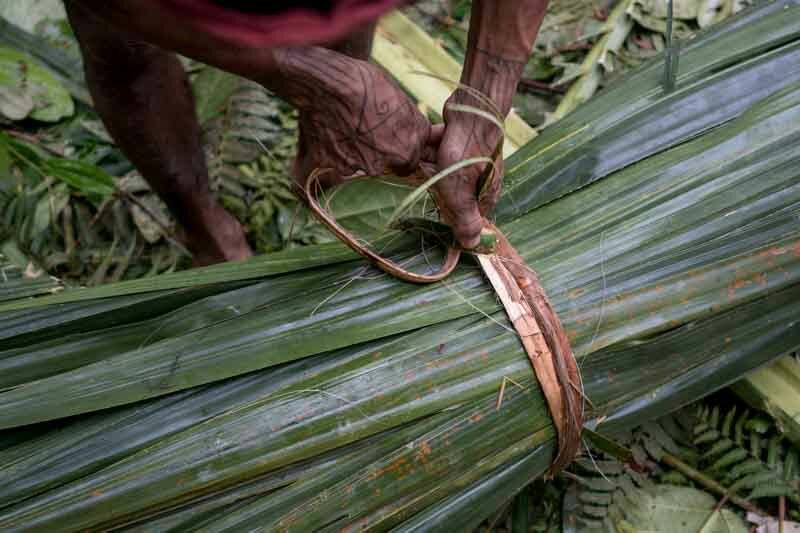 Soon big platters of mashed banana mixed with grated coconut are brought out, and smaller ones of prawns caught fresh from the river, steamed with ferns in a long stick of bamboo over the fire. There’s an organized chaos to all of it, no movement wasted – no cups knocked over by a child’s flailing arms, dogs cleaning crumbs that fall to the floor between mouthfuls. We sleep soundly and gratefully under a mosquito net on thin bamboo mats, the cacophony of the jungle a lullaby, on hardwood floors through which no jungle princess could even begin to think about a pea. The next day we head out into the jungle. They are in the midst of building a new uma for Aman Lepon’s father, Aman Lau Lau, also a shaman, and also working tirelessly to save his culture. We walk through heavy mud, women and men, children with machetes they sharpened themselves, disappearing and reappearing high up a tree with handfuls of bright-coloured fruit to share. We stop at a big palm tree, which is also their main source of food – sagu. Taking turns, they all work at different tasks to gather the palm leaves for thatch roofing. One man climbs a bamboo pole to cut them down from the canopy, a different man and woman strip them from their stems, and two more women stack them into neat piles to be strapped together and carried back to the uma. Meanwhile, children hoot, climb trees, and forage for snacks, we all sit around and chat when it’s not our turn to work, and the steamy forest provides for us all. Throughout all of this I’m conscious of the persistent calm and contentedness of the people. Their movements are sure, solid and confident; nothing is wasted. They do not strive to separate different aspects of their lives; work is exercise is food preparation is family time is meditation is social gathering. And for this reason, it seems, there is never a time to want for anything other than what exists in each precious moment. Spiritual ceremony is pervasive in a subtle way – picking flowers and leaves for their hair as they walk through the forest, simply accepting its abundance the highest honour. In the same vein, nothing is romanticized. Death, pain, aging, bursting youth, fertility, and beauty are ever-present in the uma, as they are in the forest, accepted for what they are, and all in their own time. The Mentawai spend their days immersed in various activities – collecting and preparing food, building, carving, and while Matty’s there, tattooing. Rather than separate this time as “productive” and family and social gathering as “other,” all is accomplished at once. Tasks are shared and enjoyed, and there is no space for wanting anything more or less than what they have, or what they are doing at any given time. Of course nothing is easy, but have we created an easier lifestyle for ourselves by our western illusions of convenience? In western culture we are bombarded with expectations. If only we try hard enough, we can achieve our career goals AND be a supportive partner AND cook great food AND spend just enough time with our families AND curate perfect children AND afford beautiful vacations in paradise. You should be able to have time to do all this, AND have a perfect body while you’re at it! In separating ourselves from nature, we’ve separated ourselves from essential existence; the good, bad, juicy, all of it. What is immediately noticeable about this big family is that they are content. Laughter rings through the uma, the constant energy of children is palpable, and smiling mothers and fathers and sisters and brothers tell stories in rising waves, contagious excitement flowing from one conversation to the other. Despite their extremely remote location and traditional lifestyle, the Mentawai people know the value of what they have, a virtue quickly disappearing in our world. They’re not ready to give up a culture that has provided for them for thousands of years, and are strongly resisting government schools, foreign religion, and international economic forces in their fight to continue living abundantly in these forests. One of Matty’s good friends, Rob Henry, has spent 9 years living on and off with a Mentawai community, and has documented his experience (and their fight to continue their culture) in a beautiful film called “As Worlds Divide.” If you’re interested in getting to know more about these Mentawai communities, you can watch the trailer for the film, as well as learn how to get involved in the month-long campaign to raise awareness and funds for a community-led cultural and environmental education program here. Perhaps this beautiful community will help us reflect on our own culture, our expectations of ourselves and our accomplishments, and our separation of happiness from everyday life. Perhaps life and all its messiness, with its work and conflicts and pain too, can be the very source of our happiness, fully involved, fully immersed, and fully present.